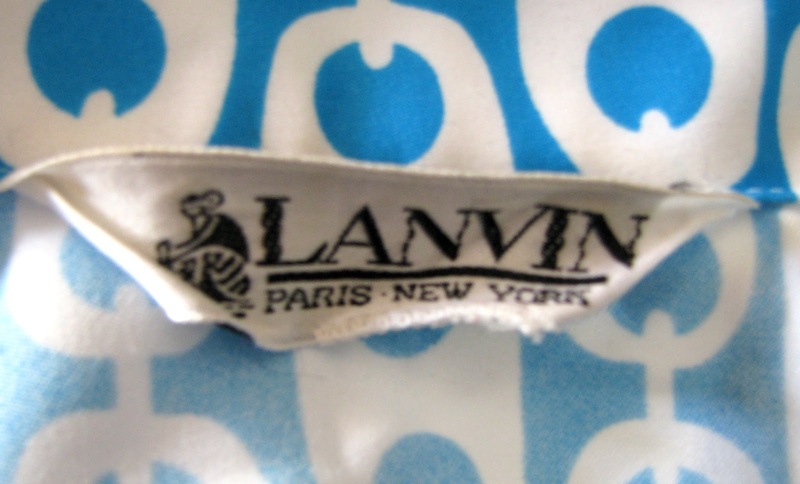 I had seen this Lanvin dress in The Sentimentalist a while back and admired the bold pattern, but at that time, it had long sleeves, and frankly, it was a whole lot of blue and white fabric for one person to carry off successfully. 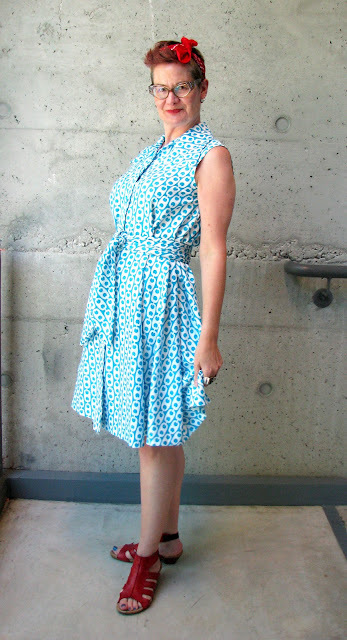 After a few people tried it on, but it remained unsold, a seamstress took the sleeves out of the dress, and Voila! I fell in love with it immediately. 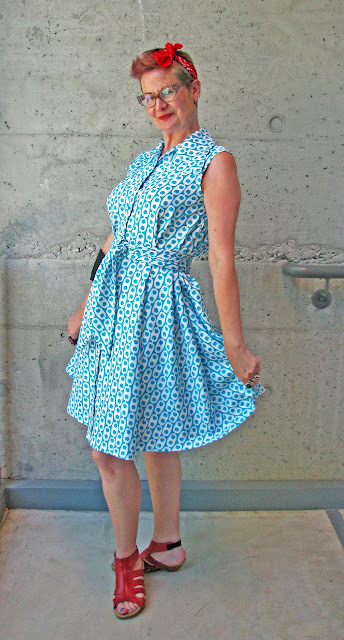 I know some people are purists when it comes to altering designer vintage (ie. "don't do it! "), but I'm of the mind that if changing the length, or removing sleeves, makes an item of clothing look better and get worn more often, then I'm all for it. I certainly don't think it changed the character of the dress; in fact, I think it made it just a little more sassy! I was experimenting with some lighting effects that came with my new Photoshop Elements software, and I think this one suited the retro vibe I was channelling with my red bandana and Madge glasses. So, what do you think? Should designer vintage be preserved in it's original state, or, should we feel free to alter it to make it wearable? Keep in mind, I'm not advocating that you hack up a pristine Chanel or Schiaparelli. Lanvin? Wow. Alter away! If something doesn't get worn, as you say, what good is it? And if a major hack job is needed, chances are we'd just give the piece a pass in the first place. You've done a great job here - this dress looks perfect on you! The retro vibe suits it. Your Lanvin dress is a beauty, I love the print. I would baulk at altering something really valuable or antique or rare, I think, but apart from that, the issue is about wearability. If altering something vintage means it fits or suits you better, and you wear it more, then why not? Your dress is a case in point. I sometimes feel sad when I come across vintage frocks which were obviously once maxi length but have been taken up to be really short, because that means they are no good for me! But then someone has made them into what they wanted at the time, and that's fine. They are only clothes! I agree about leaving one-of-a-kind/antique clothes alone. Something from the 70's/80's? Change it up. I do that all the time for theatre, sometimes clothes will just rot away in storage and that doesn't seem like a good idea. I've put real vintage on actors and have had the item fall apart while being worn, the only thing you can do then, is patch from the inside, pretty much remaking the dress. The dress is a beauty and now you'll probably wear it out. I'm all for altering to get more wear. But not to update to a trend. For instance someone shortened a gorgeous 40's dress to a mini/baby doll length cuz now it's the hip thing to do- my opinion was that it was a travesty although I was in the non-vocal minority on that one. I agree the sleeveless look helps it- as that is a lot of print/bulk for such a vivid print. Besides you look stunning in it now! This dress looks wonderful on you and I certainly couldn't imagine you in it with long sleeves. I say, make it wearable however you wish! Zoinks! This is a question I struggle with everyday...I am heartsick when I find a vintage item mangled beyond its true representation. I also am a business owner who needs to move stock. This dress was part of an estate and I fell in love with the chain pattern. But it looked like hell on everyone so I discussed it with Virginia, my seamstress at the shop and we decided it was time to chop! Shelley wears it with panache! I agree that altering is acceptable as long as you don't turn a dress into a romper. Taking out shoulder pads or removing sleeves seems logical as trends change. I love the pattern on that dress so much! It looks great with the red shoes. Nothing wrong with altering... not all vintage pieces are equal! Some look wonderful and classic, and some can just look dated and will draw attention for the wrong reasons. In the case of the latter, if a few adjustments will make it more wearable, I say go for it! After all, sometimes trends fall out of fashion for a reason, right? I dig the look of this dress! I love it! It looks wonderful on you! Lovely dress, so fabulous print!. And also lovely color combo! I think it's ok to alter a vintage piece to fit you, why not? This is a stunner Shelley! I do alter vintage- Sometimes it needs a little mending, alteration because vintage has to to worn not looked at and if it needs a little work to make it more wearable i am all for it! Lovely with the red sandals! improved by going sleeveless. Looks great Shelley! You have given this dress a new life and made it wearable. What could possibly be wrong about that. The accents of red make the ensemble shine! Brava! That looks great!! And I LOVE the shoes with it!! Fabulous!